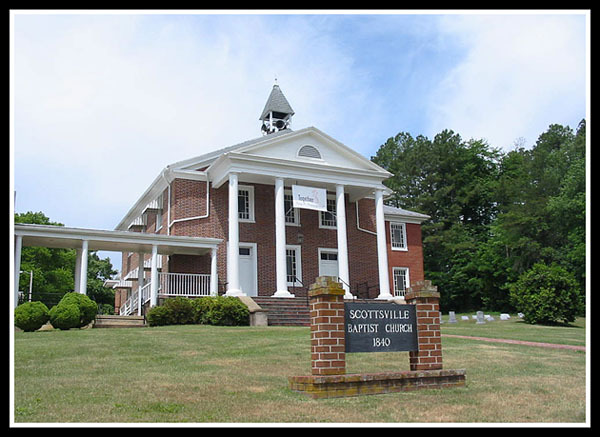 Comments: The Scottsville Baptist Church Cemetery is located on the northwest and southwest sides of the church building at 690 Harrison Street. The church was built in 1840 with property and funds donated by Anna Maria (Barclay) Moon and her husband, Edward Harris Moon, early Baptists of Viewmont near Carter's Bridge. Based on extant gravestones, the earliest burial at this church appears to be 1851 (John Conoley), and the latest, 2016 (Sheridan James McNamara). Directions to the Scottsville Baptist Church Cemetery from Scottsville Museum: Head West on Main Street. Cross over Valley Street onto West Main Street and continue one block. Turn right on Harrison Street and go 2 1/2 blocks; the Scottsville Baptist Church is on your left. The cemetery is on the right side of the church and immediately behind it. Note: Located in Nicholas Plot. Father of Amparo Alvarez Nicholas. For God hath called thee home. Note: Daughter of Joseph P. and Susie (Powers) Blair. Note: Relief lamb near top of stone with flowers on each side of it. Note: Stone is an obelisk. See John Lee Pitts. No other markings. B.M.C. was on top of a very plain vertical marker located at the right rear of the cemetery. Note: Stone has a hand with index finger pointing upward. Note: On same stone with husband, Henry Wesley Day. She has a footstone F.E.D. Note: See Frances Edmonia Day for details. No footstone for Henry. Sleep on sweet boy and take thy rest. God called thee home. He thought it best. Notes: Headstone has inset of child angel holding hourglass. Footstone marked JWD and at base is J.W. Davies Rich. Note: Flowers around top face of stone and on some on footstone. Footstone marked W.P. and at base lower right is J. Vincent Richmond, VA. Note: Footstone, M.E.D. and urn at foot. Located in Hill plot. Which bloomed and cheered my heart. How soon we're called to part. Note: Last sentence partially buried. Raised Rose inset. Having a desire to depart and be with Christ. Note: Writing fading and unable to discern all of it. Part is buried. Note: All the Fox stones are in one concrete enclosed area. Note: No date of other info but was at feet of Kate Ryland Fox. Note: Confederate cross near top of stone. Notes: He was married to Martha Jane Minor. Note: She was the daughter of Lafaette (variant Lafayette) Harris. Note: Small stone with wild rose growing to front and partially blocking. Bottom of stone also partially buried. Note: Elaborate stone with vase at top, fleur de Lis, etc. Remaining three sides are blank for names. Note: Located in Hill plot. Leave we now, they servant sleeping. The gospel for thirty years." Note: Vertical stone with Ivy at top and Palm fronds near base. Rev'd Ben'Jn G. & Ann G.
Note: Remainder of inscription illegable and partially buried. Note: Husband and wife share stone. Stone is very long rectangle low to ground with rose, stem and leaves at upper right and left. Note: Obelisk with her info facing to North with crown in a circle near top face. Foot marker has M.E.M on grave facing East. Husband, Samuel R. Moore, is on opposite side. Note: Obelisk with info facing South. Masonic Symbol in circle on face near top. Foot marker with grave facing East has S.R.M. Nicholas Plot: includes gravestones for Joseph A. Alvarez, Fannie E. Horsley, Amparo Alvarez Nicholas, Florence R. Nicholas, Frances Ludlam Nicholas, Geo. H. Nicholas, H. Reeve Nicholas, and Henry Reeve Nicholas, Jr. Note: Located in Nicholas Plot. Nickname was "Ampy." Wife of Henry Reeve Nicholas, Jr., and daughter of Joseph Alvarez. Note: John Randolph and Katherine (Pitts) Phillips were husband and wife; they share this stone. Note: Joseph was brother of John Randolph Phillips. He never married. No ill our babe can reach- it rests above, Safe in the bosom of redeeming love. Pitts Private Portion of Cemetery: contains the gravestones of Helen A. Burgess, Marjorie Anne Gibbs, John Randolph Phillips, Joseph Alan Phillips, John L. Pitts, Jr., John Lee Pitts, Kathrine Pitts, Laura C. Pitts, and Marion A. Pitts. Note: John L. Pitts, Jr., and Laura C. Pitts are husband and wife; they share this stone located in the Pitts section of the cemetery. Note: Stone is an obelisk with John Lee Pitts on one side and his wife Helen A. Burgess on the other side. Have done it unto me. Note: As of Jun 10, 2006, John Lee Pitts III was still living in Del Rey Beach, FL and was 87 years old. Part of Pitts private plot. In the full assurance of faith. dead who die in the Lord." Note: Date of death info was buried. Stone appears to have been reset in concrete. Perhaps it was broken as it is set low. Resting in peace, in the arms of Jesus. Note: Emily Rushberg and Mary Frances Quick share this headstone. Lord: they rest from their labors and their works do follow them. as a token of affection. Note: Stone is an obelisk. Note: No last name on stone but maybe a BELL as other Bells in that area. Stone is leaning at sharp angle backwards. Part of it may be buried. "A sinner saved by grace"
Note: The date of death on the gravestone is now buried in the soil. The gravestone listing of Scottsville Baptist Cemetery was compiled by Callie and John Bowers in June 2006 as part of Scottsville Museum's ongoing effort to record local church and cemetery records. This listing was updated by Connie Geary in September 2017.